Marcel Breuer (1902-1981) has been described as one of the most influential designers of the 20th century. He was an architect and furniture designer, working in both Europe and America. During a brief period in England, Breuer worked on private commissions and as a designer for the furniture manufacturer, Isokon. 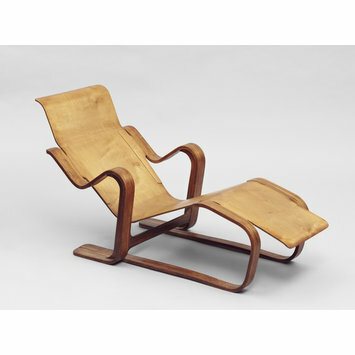 The most important achievement of Breuer's two year union with Isokon was the Long Chair. In 1936 it cost over £6 and relatively few were made. Initially the seats were sent from Estonia and attached to London-made frames. Isokon would upholster the chair in fabric of the client's choice, but the loose cover on this example is a later replacement. Although the chair's design derives from a Breuer aluminium chair of 1932-33, the use of plywood is influenced by the moulded furniture of Finnish architect Alvar Aalto. The British taste for Modernism favoured the soft curves and warm appearance of wood rather than the harsher aesthetic of metal furniture. Long, reclining chair with laminated birch frame, including arms, plywood continuous seat/back and long cushion with cover, that covers the length of both seat and back. Stamped in centre of plywood seat at foot end. 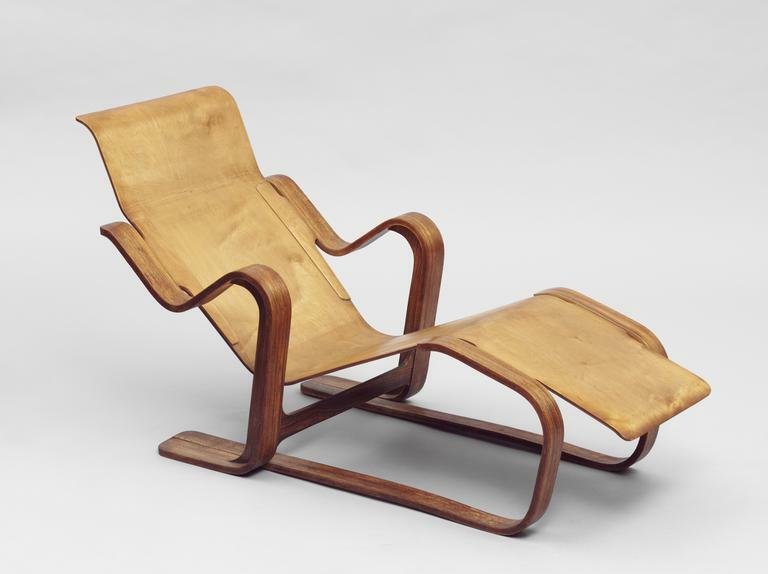 Breuer's earliest version of the Long Chair utilized a mortise and tenon joint at the connection between the frame and the seat that became loose over a period of time from use. The second incarnation, as in this example, uses a n improved joint to connect the frame and seat providing greater stability. 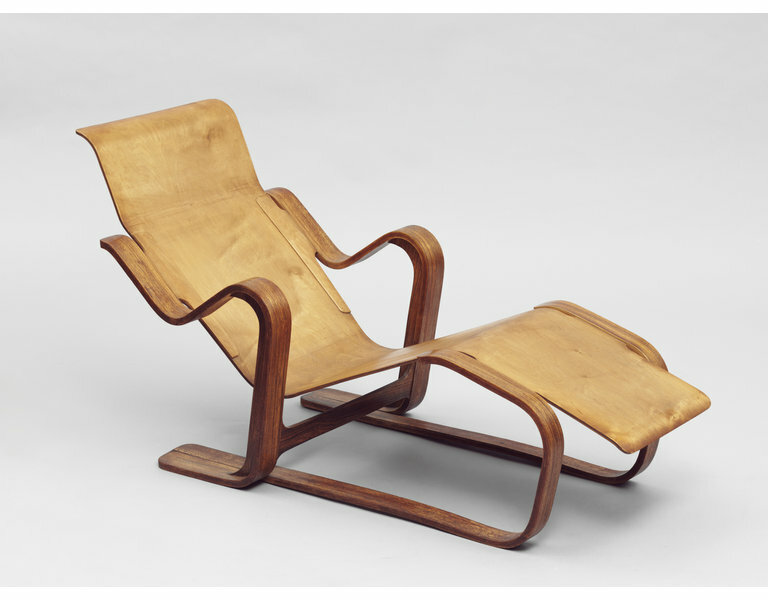 The most important achievement of Breuer's two year union with Isokon was the Long Chair. In 1936 it cost over £6 and relatively few were made. Initially the seats were sent from Estonia and attached to London-made frames. Isokon would upholster the chair in fabric of the client's choice but this loose cover is thought to be later. British Design since 1880, Fiona MacCarthy, Lund Humphries, 1982. Isokon was a company devoted to the production of modern furniture founded by the visionary modernist Jack Pritchard. Bauhaus emigres Walter Gropius and Marcel Breuer were its Comptroller and designer respectively.